In this series of workshops, we will explore the skills for critiquing your own work and the work of others. It is an opportunity to learn to see, with useful questions to help edit your own work while in process, and to understand how others see your work. Language is essential for having a conversation or writing about your work and in this workshop, we’ll introduce the vocabulary necessary to describe what you see or want to see. If you are anxious about sharing your work and receiving feedback, fear not! The instructor creates a supportive, constructive framework for the group conversation. The three session format over six weeks, is designed to introduce ideas and give students time to put them into practice. Prints critiqued in the first or second session can be reworked for feedback in subsequent sessions. 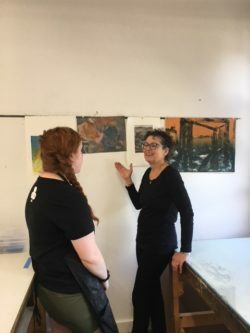 Students will be asked to bring a few prints to the workshop – a combination of finished and unfinished work.